Blogging about what I'm cooking. Not as much deep-fried stuff anymore, but hey, it's a catchy name. This is another great and simple pressure cooker recipe from hippressurecooking.com. 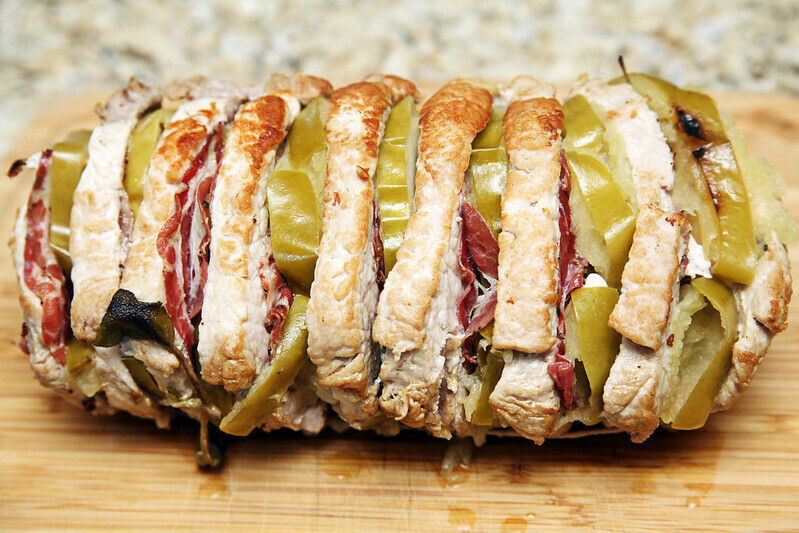 Following the Hasselback potato trend (see here for example), they decided to up the ante and cook a pork loin roast using a similar method. The result: a surprisingly easy recipe that had my 2-year-old asking for seconds and thirds. Turn roast fat-side down on a cutting board and make a cut every ½" running crosswise - for each slice only cut ¾ of the way down the roast, leaving all of the slices connected. Add a slice of coppa at one end of the roast, and fill each cut with one apple slice and one coppa slice. 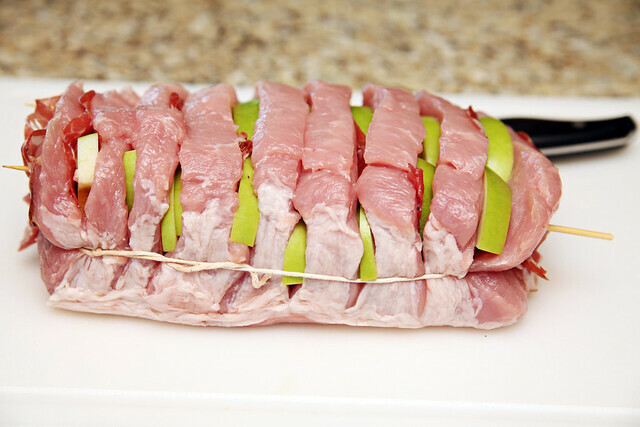 Insert two bamboo skewers near the center of the roast and press them through as each cut is filled - if the coppa and apples are slightly larger, that is fine but you can also pull and tug on the pork meat to lightly change the shape of each cut. When the last cut is filled add a coppa slice the outside of the roast. Using kitchen string, wrap the roast horizontally using the skewers to fasten, if necessary. In the pre-heated pressure cooker over medium-high heat, add oil and sage leaves. When the leaves start to crackle add the roast and brown on all sides. Turn off the heat and pour in the wine and water. Close and lock the lid of the pressure cooker. Turn the heat up to high and when the cooker reaches pressure, lower to the heat to the minimum required by the cooker to maintain pressure. Cook for 15 minutes at high pressure. When time is up, open the pressure cooker with the Natural release method - move the cooker off the burner and wait for the pressure to come down on its own (about 10 minutes). For electric pressure cookers, disengage the “keep warm” mode or unplug the cooker and wait for the lid-locking pressure indicator to go down (20 to 30 minutes). Transfer the roast to a serving platter and remove the skewers and string - pour cooking liquid and sage leaves over roast before serving. You can use any kind of apple you'd like. I like Granny Smiths for the tartness they add. Looks great - the green apples add great color, too! So you got an Instant Pot...now what? This is a Flickr badge showing public items from jkelber tagged with blog. Make your own badge here.